What I haven't mentioned in that list are wikis. You've probably used them on the web - even if only Wikipedia. 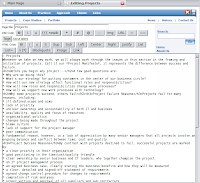 With a wiki you get instant page editing in most web browsers; simplified formatting using wiki syntax; linking between articles, embedding of documents, code, links, capped with simple publishing as a web page - great. Except most wikis are 'server-side' programs that need to be hosted and administered on a server. However, there's another category of software called personal wikis. There are several around, notables being Tiddlywiki (and derivatives like Qwikiweb), Doxwiki and my current favourite, Wiki on a Stick (commonly shortened to WoaS). Not just a catchy name, I carry mine around on a USB memory stick. You can see the default layout below. 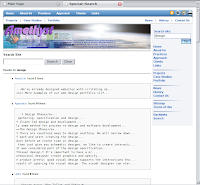 The software is available as a free download at http://sourceforge.net/project/showfiles.php?group_id=155218. It works on its own terms: it genuinely is a standalone tool with inbuilt controls for permissions, settings, cascading stylesheets and so on. You can use as much embedded HTML code as you want: the Edit window lets you mix and match HTML and wiki syntax – so I do (below). WoaS automatically handles text searches (it's a strength of the personal wikis), so no need to manually index your keywords. The results are presented clearly, too. It's got edit-locking and true AES encryption to make it tamper-proof and secure. Consider the encryption in case you lose your memory stick. It's still effectively a pre-production beta release - I'm on version 0.9.6B. It's maintained by one developer with a small but active community around it (the WoaS forums are good at http://woas.iragan.com/). You can only edit your local copy, not one sitting on any remote server - so remember which instance is your 'master', keep it backed up and republish to the web after any edits. Embed images: I still think embedding image data in a text file that I'm editing is asking for trouble. I even removed the default WoaS button images - also so I can use my own. Its all html so url(images/home.gif) for your own backgrounds and buttons works fine. Embed large, complex documents: remember, anything you embed will bloat the size of the text file. You won't want to embed your Full Circle PDF's. Use the wiki as the home page on my web-site - its a big file and can take a while to download a cached copy into the browser. I keep a flat, fast HTML banner page and redirect to WoaS for my content pages. Hey, a two-page web site isn't bad going. Full Circle Magazine #34 Available! What Makes a Digital Messiah?